Here we are again! Another week gone by with no posts in between ‘our creative spaces’. We’ll try to change that for next week or I’ll sound like a broken record! This little guy is made using Twig and Thistle’s pattern from a few years back. Elijah’s a little bit young for eggs so he’ll be going on a bunny hunt instead come Easter. Bun bun is made from some lovely flannel type fabric I picked up at my new favourite place Patchwork with Gail B. I seriously did not know until this week that the biggest quilting shop in Victoria is within walking distance of my house! 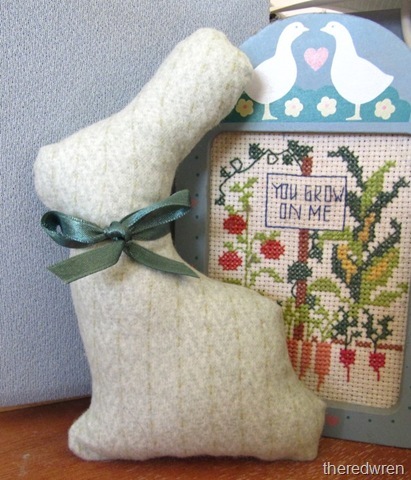 These bunnies only take ten minutes and are very addictive – stay tuned for a bunny family!